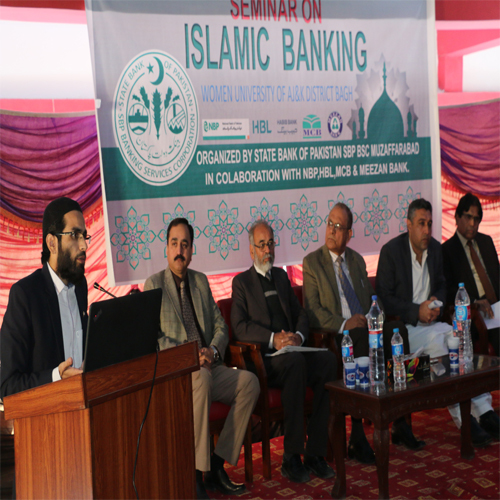 Department of Business Administration in collaboration with State Bank of Pakistan, National Bank Bagh, Muslim Commercial Bank Bagh and Meezan Bank organized a one day seminar on Islamic banking on 21 st nov, 2017. The aim of the seminar was to provide the awareness to the students about Islamic concept of banking which is one of the emerging fields in banking sector. It also aimed to provide general awareness to female students about career opportunities (jobs and internships) and other aspects of scholarships and loan facilities available to students. Mr. Zulqurnain Haider, Senior Vice President, Meezan Bank, Ltd., provided a detailed presentation on the emergence and scope of Islamic Banking. He also differentiated between conventional and Islamic banking. He also addressed the challenges and criticism Islamic Banking has to face. He cleared the general doubts prevailing about the Islamic banking. The Vice Chancellor Prof. Dr Muhammad Haleem Khan, the Dean of Social Sciences, Prof. Dr. Saeed Ahmed Sheikh also presented theirs views on the subject and presented the souvenirs to the guests. The faculty member along with the students showed a keen interest in the topic. The students from Department of Business Administration, Department of Economics and Department of English participated and raised several questions at the end. Amongst the faculty members, Dr. Saeed Akhtar, Chairperson Department Of English, Dr. Badshah Nawaz, Chairperson Department of Economics, Mr. Qamer Ahmed, Lecturer, Miss Komal Tariq, Lecturer, Miss Nagina Liaqat, Lecturer, Miss Maria Baber, Lecturer, Miss Gazala, Lecturer participated Miss Sumera, lecturer, Miss Waheeda, Lecturer, Miss Rashida Lecturer participated in the seminar. Mr Sajjid Ali ,Assistant Chief Manager, State Bank. Mr Tanseef Hussain, Senior Officer ,State Bank. Mr Zulgurnain Haider,Assistant Vice President, Meezan Bank. Mr Arbab Abbasi ,Manager, National Bank Bagh.